The most visited of the islands in the archipelago, Contadora Island benefits from having the area's only airport, linking it to the mainland and boosting tourism. On the 7th (Sun), kick back and relax at Playa Ejecutiva. For traveler tips, where to stay, reviews, and tourist information, read our Contadora Island trip planner. Porto, Portugal to Contadora Island is an approximately 18-hour flight. The time zone changes from Western European Time to Eastern Standard Time, which is usually a -5 hour difference. Plan for much hotter temperatures traveling from Porto in April, with highs in Contadora Island at 39°C and lows at 28°C. Wrap up your sightseeing by early afternoon on the 7th (Sun) to allow time for travel to Portobelo. Start off your visit on the 8th (Mon): enjoy the sand and surf at Playa Blanca and then step off the mainland to explore Isla Grande. Keep things going the next day: brush up on your military savvy at Museo de La Real Aduana de Portobelo, discover the deep blue sea with a scuba or snorkeling tour, and then pause for some photo ops at Black Christ. To see more things to do, photos, other places to visit, and tourist information, read our Portobelo trip itinerary maker . Getting from Contadora Island to Portobelo by combination of ferry and taxi takes about 2.5 hours. Other options: do a combination of ferry and bus; or do a combination of ferry, shuttle, and bus. 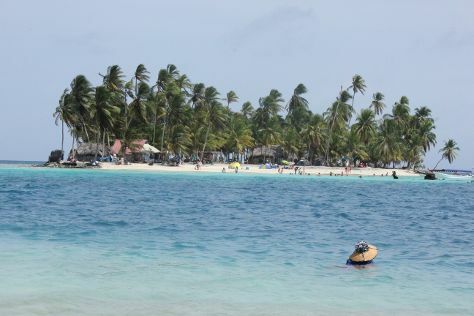 Finish your sightseeing early on the 9th (Tue) so you can take a bus to San Blas Islands. On the 10th (Wed), step off the mainland to explore Isla Perro. To see traveler tips, maps, and more tourist information, use the San Blas Islands driving holiday tool . Getting from Portobelo to San Blas Islands by bus takes about 2 hours. Other options: ride a ferry. Expect a daytime high around 39°C in April, and nighttime lows around 28°C. On the 10th (Wed), wrap the sightseeing up by early afternoon so you can travel to Bocas Town. Start off your visit on the 11th (Thu): soothe aching muscles at some of the top local wellness centers, admire the natural beauty at Finca Los Monos Botanical Garden, and then look for all kinds of wild species at Wildlife Areas. Get ready for a full day of sightseeing on the next day: admire the masterpieces at Plastic Bottle Village, then enjoy the sand and surf at Boca del Drago, and then enjoy the sand and surf at Starfish Beach. For where to stay, ratings, maps, and other tourist information, read our Bocas Town driving holiday planning app . Traveling by combination of bus and flight from San Blas Islands to Bocas Town takes 4 hours. Alternatively, you can fly; or do a combination of ferry and bus. When traveling from San Blas Islands in April, plan for little chillier days in Bocas Town, with highs around 33°C, while nights are somewhat warmer with lows around 33°C. Wrap up your sightseeing on the 12th (Fri) to allow time to ride a ferry to Isla Bastimentos. 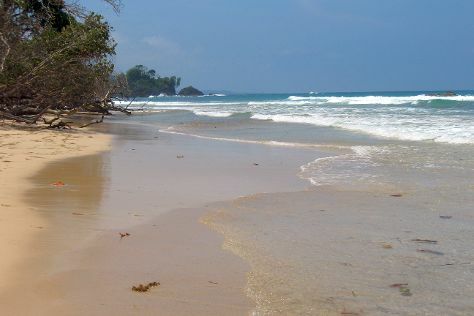 Sitting fairly close to the mainland and just a short boat ride from Bocas del Toro International Airport, the well-connected but still preserved Isla Bastimentos offers access to a national park of protected rainforest and coastline, as well as an abundance of small, uninhabited islands dotted just offshore. Kick off your visit on the 13th (Sat): stroll through Wizard Beach and then tour the pleasant surroundings at Red Frog Beach. Here are some ideas for day two: head off the coast to Isla Bastimentos and then kick back and relax at Polo Beach. To find photos, ratings, where to stay, and more tourist information, go to the Isla Bastimentos road trip app . Isla Bastimentos is just a short distance from Bocas Town. In April in Isla Bastimentos, expect temperatures between 33°C during the day and 33°C at night. Finish your sightseeing early on the 14th (Sun) so you can travel to Panama City. Get a sense of the local culture at Casco Viejo and Cinta Costera. The adventure continues: make a trip to Panama Canal, explore the wealth of natural beauty at Metropolitan National Park, take an in-depth tour of Museo del Canal Interoceanico de Panama, and contemplate in the serene atmosphere at San Jose Church. For traveler tips, reviews, photos, and other tourist information, refer to the Panama City trip planner. You can do a combination of ferry and flight from Isla Bastimentos to Panama City in 3 hours. Alternatively, you can do a combination of ferry and bus. Traveling from Isla Bastimentos in April, you will find days in Panama City are a bit warmer (38°C), and nights are slightly colder (30°C). Finish your sightseeing early on the 18th (Thu) to allow enough time to travel back home.